Following their stunning performance of ROMEO AND JULIET earlier this year, Birmingham Royal Ballet return to The Lowry to celebrate the 400th anniversary of Shakespeare’s death with SHAKESPEARE DREAM BILL. Combining contemporary ballet with traditional pieces, the SHAKESPEARE DREAM BILL showcases the range and beauty of Birmingham Royal Ballet and brings together three works – WINK, THE MOOR’S PAVANE and THE DREAM – into one two and half-hour show. The programme opens with WINK, a brand-new piece of work by American choreographer Jessica Lang. Set to a thrumming new score by Jakub Ciupinski, this stylish and abstract exploration piece captures the poetry of Shakespeare’s sonnets. A voiceover reads out extracts from five of Shakespeare’s sonnets – 43, 30, 64, 40 and 71 – as a male soloist and two couples duet reflect on its contrasting moods and colours. Peter Teigen’s inventive lighting design holds one couple in light and another in shade, shifting the mood from sunny and playful to blue introspection, while Mimi Lien’s innovative set switches from black to white to give the illusion of a blinking eye. Like the music, the choreography echoes the structure of the sonnets, prompting dances tugged by longing and regret. Brandon Lawrence is particularly memorising, bending, swaying and as rolling his body to the words like a piece of music, bringing to life the ripple of the patterns. This is an attractive piece of modern ballet that is intelligent, well designed and well executed. José Limón’s THE MOOR’S PAVANE distils the passion and drama of Shakespeare’s OTHELLO into a thrilling one-act tragedy. Created in 1949, this dark and dramatic piece remains a classic of American modern dance and tightly focuses on four characters – The Moor (Othello), The Moor’s wife (Desdemona), His Friend (Iago), and His Friend’s Wife (Emelia). Set to the music of Purcell, the dancers move in a tight circle on a dark stage, attempting to follow the decorum and niceties of the stately court dance as jealously and passion burn beneath the surface. This is a piece that requires outstanding actors and Tyrone Singleton is excellent as The Moor, majestically bending backwards as his arms sweeping like sabres. Delia Mathews as The Moor’s Wife and Samara Downs’ as The Friend’s Wife are equally strong but the performance truly belongs to Iain Mackay as the menacing and conniving Moor’s Friend, curling his leg over The Moor’s hip as whispers venom in his ear. The triple bill concludes with a touch of magic and mayhem in a revival of Sir Frederick Ashton’s THE DREAM. 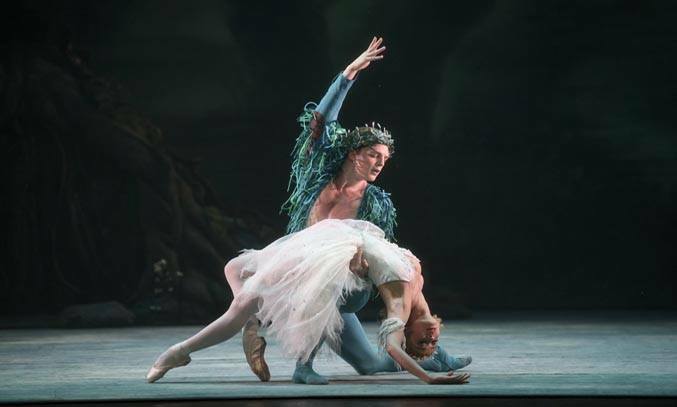 This elegant and witty interpretation of Shakespeare’s A MIDSUMMER NIGHT’S DREAM is danced in purposeful Romantic style and demonstrates Birmingham Royal Ballet’s renowned flare for storytelling and world-class dance. Two stories (that of the fairies and the mortals) coincide on one stage in a perfectly imagined Victorian world of fairies and sprites, bumpkins and lovers. Momoko Hirata shines as the subtly powerful and dominant Titania, as do Samara Downs, Tom Rogers, Laura Purkiss and Tyrone Singleton as the mortal lovers. Kit Holder provides the most entertainment as Bottom, his pointe work and superb comic timing putting a smile on the face of everyone in the audience. But it is Mathias Dingman as Puck who truly impresses, with his fast movements, informative mime, giddying turns and breathtaking speed stealing each scene. A special mention must go to the Royal Ballet Sinfonia led by conductor Paul Murphy for their flawless performance of each score. Whether you’re a fan of Shakespeare or of ballet, you are sure to enjoy Birmingham Royal Ballet’s SHAKESPEARE DREAM BILL. A stunning piece of captivating storytelling and world-class dance. Birmingham Royal Ballet’s SHAKESPEARE DREAM BILL runs at The Lowry until 17 September.